Accuracy: RMA 4%; RMB 3%; RMC 2% of FS. Weight: RMA 4 oz (113.4 g); RMB 13 oz (368.5 g); RMC 39 oz (1105.6 g). Process Connection: RMA 1/8"; RMB 1/4"; RMC 1/2" female NPT. Pressure Limit: 100 psi (6.9 bar). We are amongst the most reputed names in the industry, offering Polycarbonate Flowmeter. 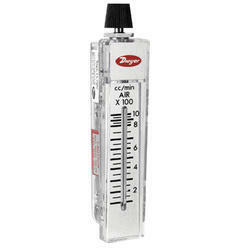 We are a top-notch organization, engaged in providing Polycarbonate Flowmeter.